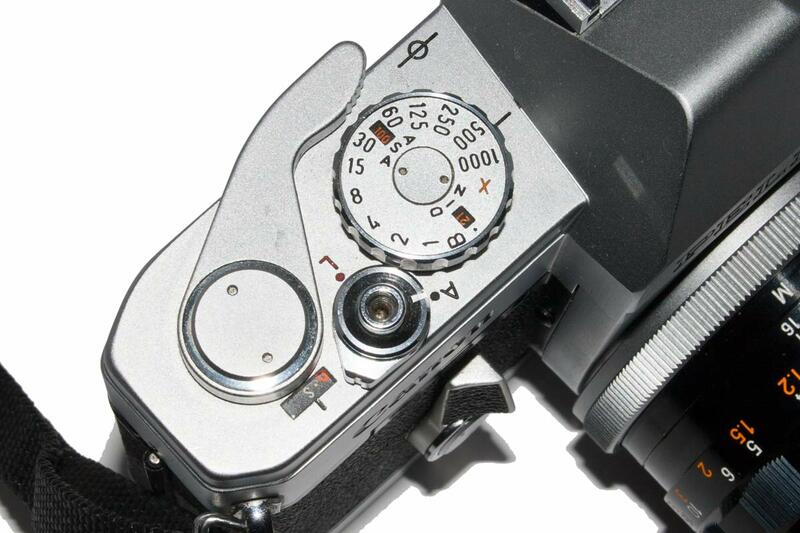 The Pellix is handsome, as all of the F Series are, and it is a solid well made camera to hold. This is a picture of the example in my collection which I acquired from my friend Edwin in July of 2016. 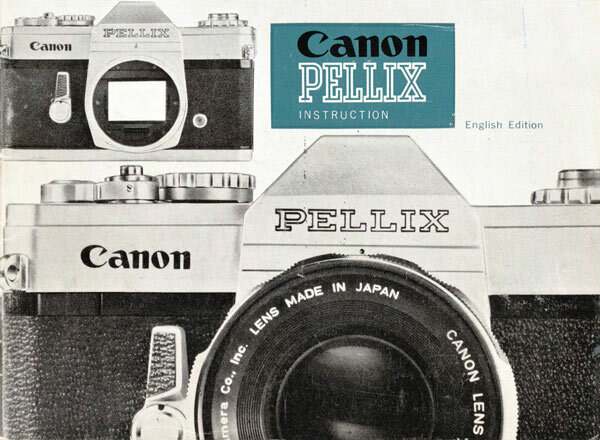 The Canon Pellix was an innovative imaginative camera when introduced in April of 1965. At the time it was considered revolutionary and contained concepts that seemed very advanced. But it was not to last. 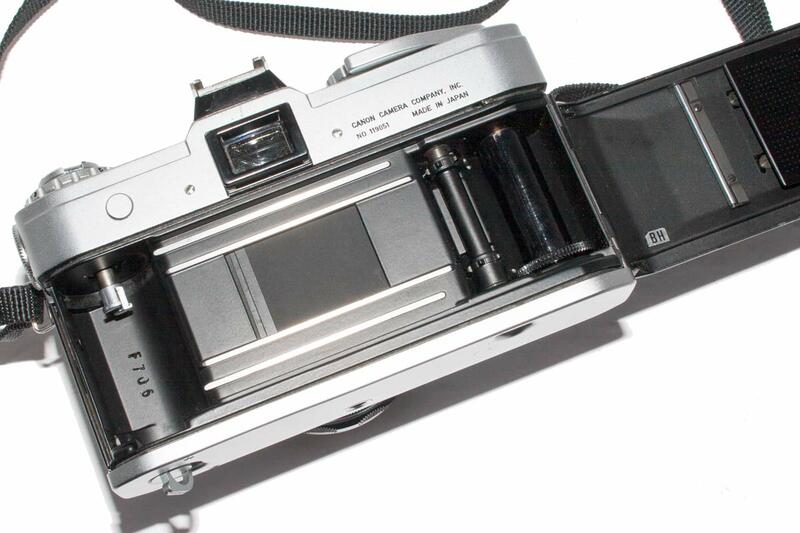 This was the first Canon camera with TTL metering. The way this was done was unique. Looking at the front of the camera there is a lever to the left of the lens mount. By pressing this lever towards the lens it caused the lens to stop down and a CdS cell to rise up in front of the shutter. This cell gathered light from a rectangle of about 12% of the image area in the center of the image. That area corresponded roughly to the rectangle visible on the ground focusing glass. When the lever was released, the lens opened again to full aperture and the photo cell retracted out of the light beam. Photo “B” shows the metal baffle as it should be. The plate is held in by the four visible screws but across the bottom between the two screws it is poorly supported. When I received the camera the plate was deformed as shown in “A” and the aperture release lever was catching on it and would not move. As a result the lens aperture would not function. Photo “B” shows the plate after I took it from the camera and straightened it. Putting it back in was a bit tricky as the plate was deformed by the process and I had to do some bending to realign all four screw holes. I have a Pellix QB and the light baffle is bent in exactly the same location. It appears that the poor support combined with users being rough in mounting their lenses cause this problem. I note this light baffle is not present in other F Series cameras. Its purpose may be to reduce extraneous light bouncing around inside a camera that already has too much light from the viewfinder eye piece bouncing around. The shutter and aperture were connected into the meter circuit. To set the exposure one kept the lever pressed while adjusting the aperture or shutter or both until a meter needle on the right side of the view finder image was over a round dot that appears etched on the ground glass. Awkward but certainly better than a loose light meter in the pocket. 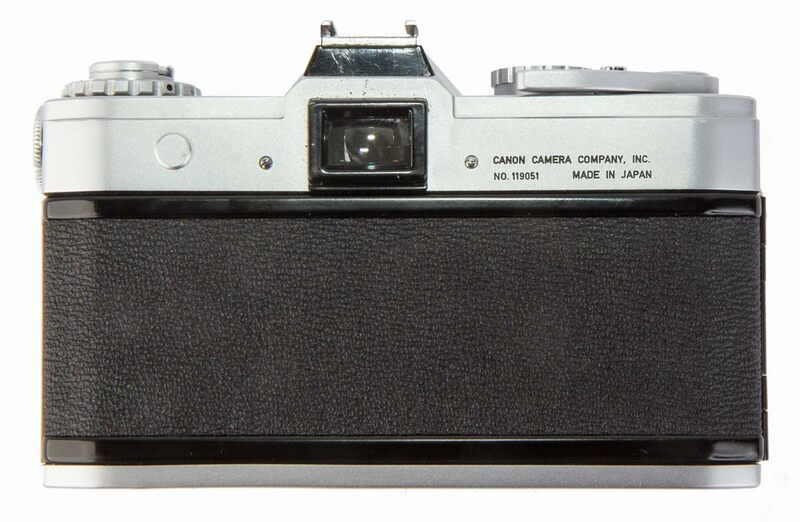 The light sensor was powered by the 625 mercury cell located in the battery holder on the left edge of the camera by the rewind crank. The canon Pellix was notable for the nature of the mirror it used. 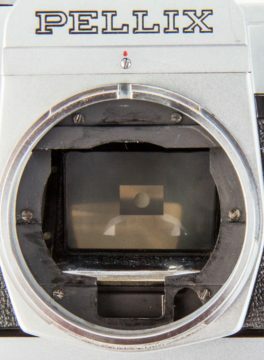 Instead of the mirror that swings up out of the way at the instant the shutter is opened, it had a fixed 45 degree mirror that did not move. The Pellix pellicle mirror was an ultra-thin (0.02 mm) Mylar film with a vapour deposited semi reflecting layer placed at 45 degrees to the light beam. 30% of the light was reflected upwards to the ground glass in the viewfinder and the remainder continued straight on to the film. This arrangement did away with the noise, vibration and mechanical complexity of the swinging mirror. It also meant that when the shutter fired there was no blackout of the image in the viewfinder. And because the mirror did not swing up, there was more room for lenses that extended back into the camera further. 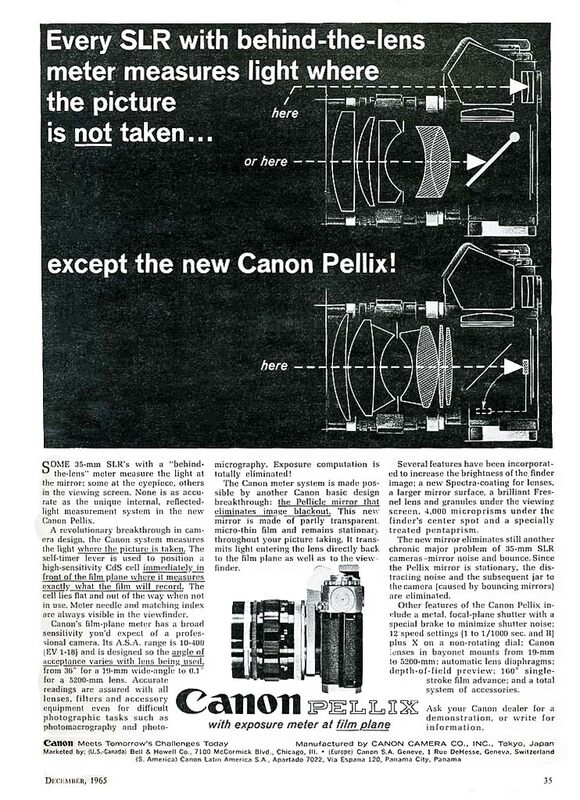 Canon actually made a lens for exclusive use on the Pellix, by reason of its extension back into the body. However, these advantages were outweighed by some serious problems that resulted. Less light got to the film. That was not really too bad because 30% reduction amounted to only about a half stop in exposure. 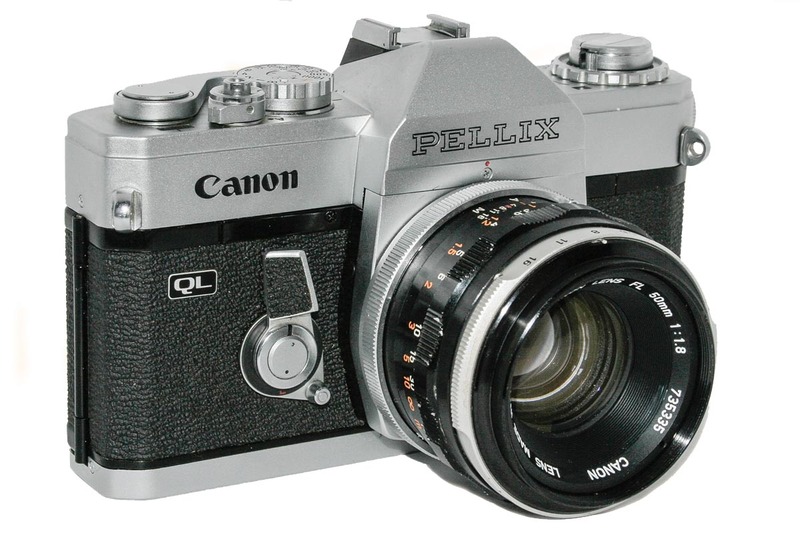 To partially compensate for this loss, Canon made a standard lens for the Pellix, the FL f/1.2. With fast lenses and higher speed film that was considered a reasonable trade off for the perceived advantages. A more serious disadvantage was that the swinging mirror also served to block stray light from the eyepiece which might affect the film. This was perceived to be such a problem that the camera had an eyepiece cover built in that could be employed using the ring under the rewind crank. But there is a more serious problemstill: the pellicle mirror itself remained in the light stream at all times. Dirt, grease, fingerprints, scratches all were there to lower image contrast and appear on the film. The swinging mirror was tolerant of dirt because it swung up out of the way and the dirt was not visible. But on the pellicle mirror it was there for the world to see. This meant cleaning the mirror. However, the mirror was delicate and easily damaged. Every time you changed lenses the mirror was right there and open to dirt and damage. Another more minor problem was that the shutter curtains had to be metal because there was no solid light blocking swing mirror to protect the shutter from being burnt by a focused image of the sun. Taking a picture of a sunset, for instance, would mean that while you composed the shot, that image of the sun was focused on the shutter and fabric would burn very quickly. The lens was essentially a magnifying glass. 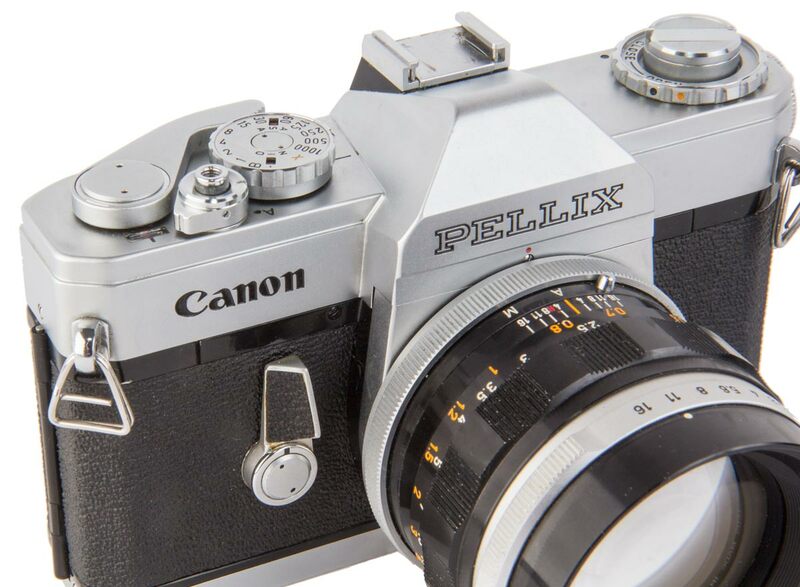 Canon followed up with an improved Pellix, the Pellix QL but after that they dropped the concept from their main stream camera line. 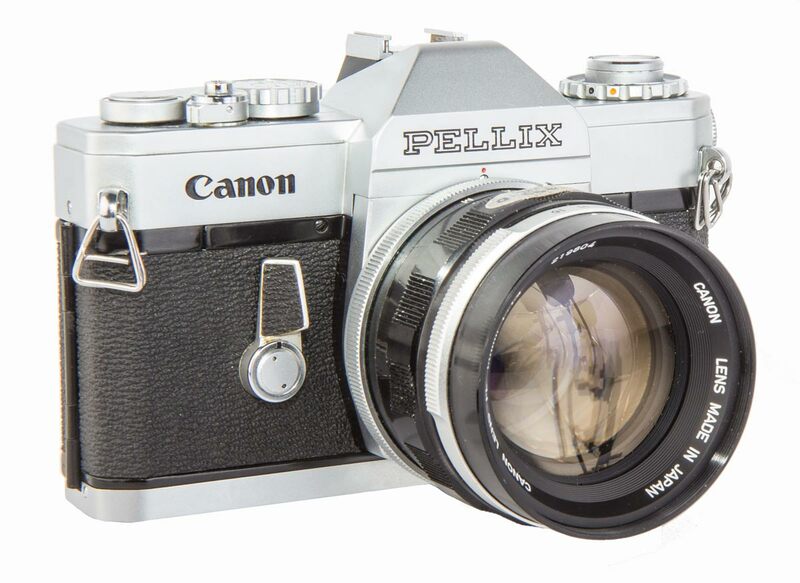 The next 35mm SLR to employ the pellicle mirror was the Canon F-1 High Speed released in 1972. The object was ultra high speed images in rapid succession and the moving mirror would not allow for this. The mirror design was the same as in the Pellix. In 1984, Canon released another version of their then New F-1, which attained a record 14 frames per second performance, being the fastest analogue SLR of that time. 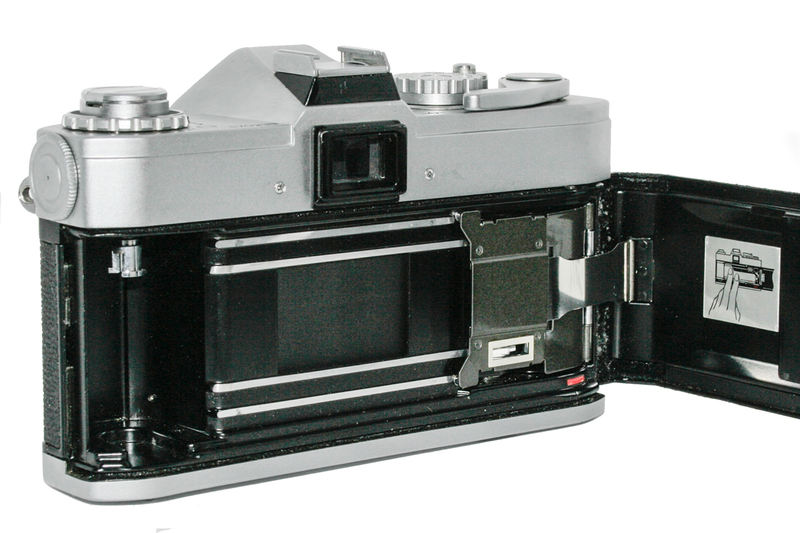 Two further Canon models were produced with pellicle mirrors, the EOS RT and the EOS-1N RS, the RT being based on the EOS 600/EOS 630 and the 1N RS being based on the EOS-1N. Most of the original Pellix and the Pellix QL’s were issued in chrome but a few may be found in black. This camera has some issues.The exterior is cosmetically excellent and it appears to function well. However the equipment shoe on top shows some scratches and the black plastic is scratched. In the viewfinder there are marks on both sides of the image where the prism reflective coating is damaged. There also appears to be a red line vertically thru the center of the screen. Not sure why but may be damage to the optical coating on the center edge of the roof prism. The eyepiece lens also appears to have a very small fracture however, this is not visible in the viewfinder. 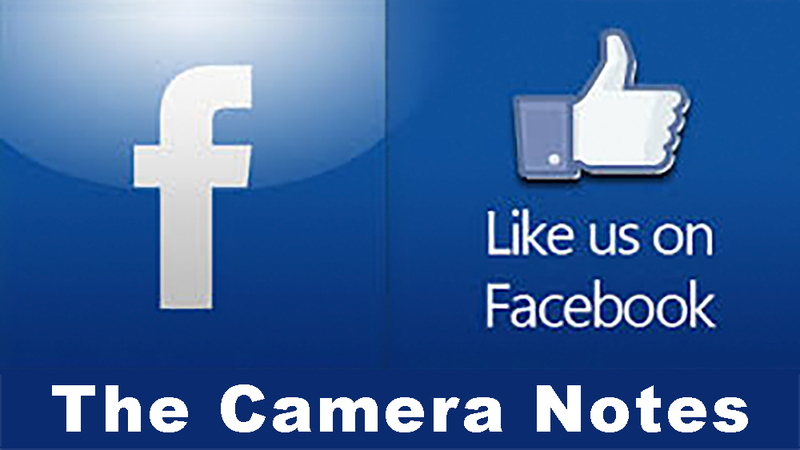 There is another very interesting problem that may afflict many Pellix cameras. I have two, the Pellix and the Pellix QL and they both suffer from this. Inside the lens mount there is a metal light baffle that circles the opening. That is shown in Photo’s A and B. 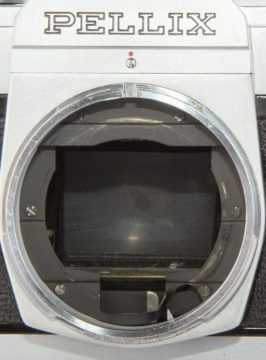 At the center bottom is an opening for the lens’s aperture lever and the aperture release lever of the camera is behind it. To the right of that opening is a cutout that appears to be for the aperture release pin on an R Series lens. 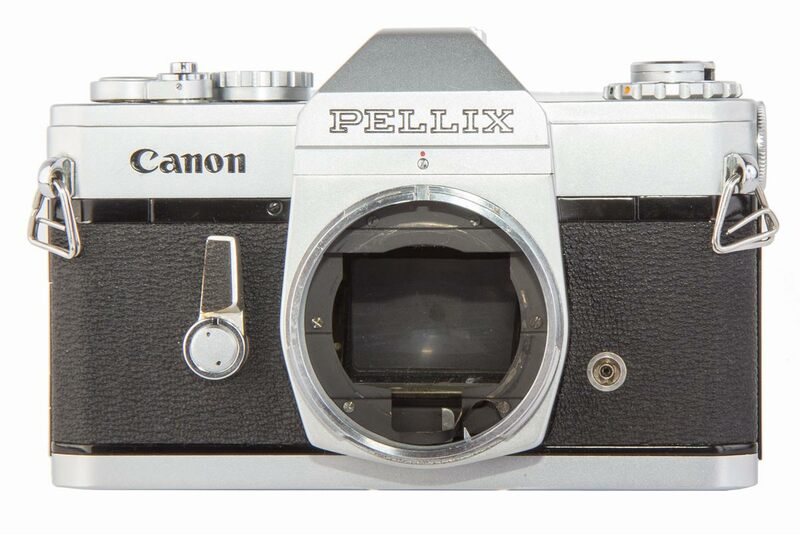 However, the aperture of that lens does not function on the Pellix. Photo “A” The damaged light baffle is shown just to the right of bottom center. The bright triangular structure is part of the camera aluminium body intended to support that corner of the metal baffle. Photo “B” Here is visible the metal light baffle straightened and reinstalled as it should be. The bright triangular piece is now under the corner of the metal baffle supporting it. Canon often improved cameras during production without changing the model name. In March of 1966 an improved Pellix was released. The most obvious change was the addition of the Quick Loading (QL) mechanism which made the loading of the film faster and easier. But there were other changes as well. In the battery compartment electrical contacts were added for the separately available internal light meter booster. Also involving exposure, a lock was added to the large meter cell lever on the right front of the camera. And respecting film speed, the selectable film speeds were updated to ASA 25 to 1600. There is an unmarked detent that actually represents about ASA 2000 but it is not so labeled. And finally, the labelling on the left top plate for the eyepiece shutter was clarified to make the operation more intuitive. Otherwise, this is the same camera in all respects. It looks and feels the same but it is a little easier to operate. Using the light meter is still awkward and the pellicle mirror still suffers from the problems listed above. 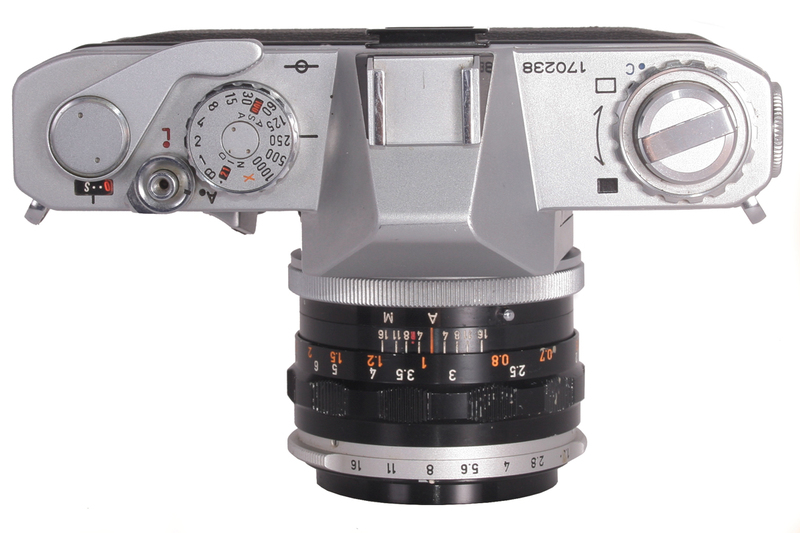 However, with these changes the camera was introduced as the Pellix QL. Personally, I like it and it is a fun camera to shoot with.